The mission of Breastfeeding USA is to provide evidence-based breastfeeding information and support, and to promote breastfeeding as the biological and cultural norm. 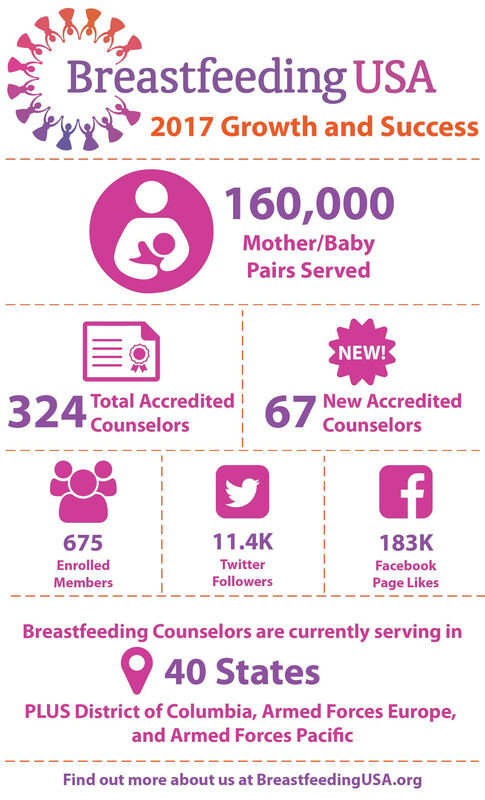 Contact Your Local Breastfeeding Counselor Do you have a breastfeeding question or concern? Locate! Find your local support. Questions About Milk Production: When will my milk come in? Do any of the following statements sound familiar? Breastfeeding USA has been recognized for ongoing transparency with a 2018 Gold Seal on our GuideStar Nonprofit Profile! Families belong together, in part because the biological norm of breastfeeding does not stop at a nation’s border. Breastfeeding USA condemns the separation of children from their families, and especially separation of nursing children from their parents. Human babies are extremely vulnerable for a long period of time. Their normal neurobiological development requires prolonged access to the mother. IBCLCs (International Board Certified Lactation Consultants) aren't people we typically see when breastfeeding is going well. If we are working with one, we usually are tired, stressed, worried, overwhelmed, maybe in pain, or even wondering if our child is getting enough to eat. In this situation, it often feels like the most we can do is to contact one and hope they can help. Our newsletter reaches out to all members, volunteers, and donors to Breastfeeding USA, AND to all those who breastfeed and who provide vital support to mothers and children. Breastmilk provides all the water your baby needs, even in hot and dry climates. "The water content of breastmilk consumed by an exclusively breastfed baby meets the water requirements for infants and provides a considerable margin of safety."